The two springs are set above the horizontal tracks. They are stretched when the door is closed and contract during opening. It is easy to notice damage to the coils. They are highly unlikely to get chipped, but they may be permanently stretched and deformed. In this case, they should be replaced right away. There should be safety cables running through the springs. If they are damaged, they will require immediate replacement. The other parts of the spring system should be examined for wearing and damage too. These include the four pulleys and the two lift cables. If the cables are frayed and/or have cuts of any size, they will need replacement. 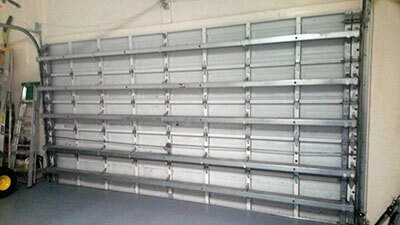 There are three main tests to perform as part of regular garage door maintenance. The first one is for the safety sensors. It involves waving a long object in front of the sensors while the door is closing. At this point, the unit should stop and reverse immediately. If it keeps going down, the sensors should be repaired or replaced. The sooner this is done the better. The second test is for the opener’s closing force. It requires setting an object which doesn’t block the sensors underneath the open door. When the door goes down, it should touch the object and go back up. If it hits the object, the force should be reduced. The third test is very basic. It involves pulling the emergency release cord to see if it works. If it doesn’t, it has to be fixed or replaced without delay.